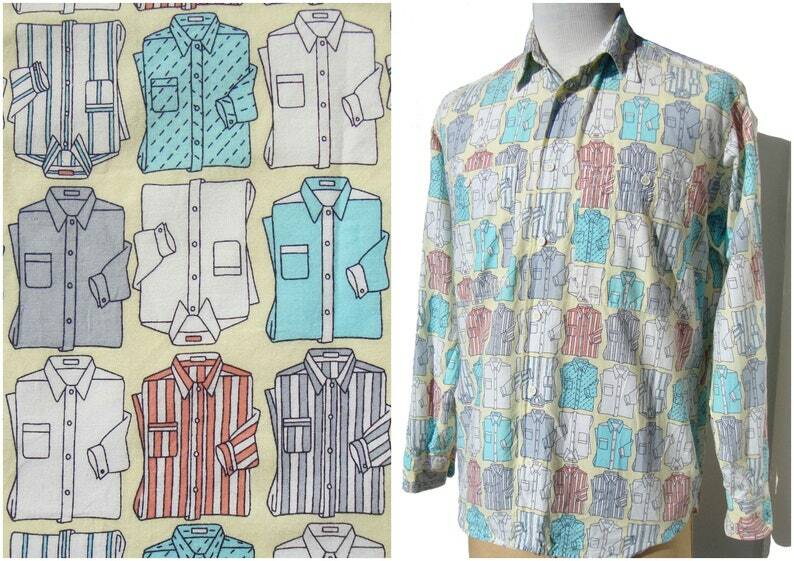 An array of neatly folded shirts makes up the fun novelty print on this vintage men’s cotton shirt by Benetton, circa early 1990s. The well made shirt consists of a medium weight cotton, and features a pastel print of folded shirts in colors of turquoise, coral, dove gray and white, over a pale yellow ground. The shirt itself has long sleeves with cuffs, pointed collar, button down placket, patch pocket, and two labels – one for “Benetton”, “Made in Italy” with cowboy and horse logo, and the other with fabric care instructions, which include “Made in Italy”, and “100% Cotton”.